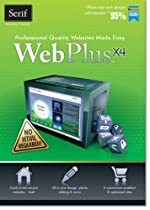 WebPlus X4 is website creation software by Serif. Create attractive, engaging business websites -- with no HTML or prior experience -- using this powerful, flexible and easy to use software. Includes a visual page designer, forms, free online tools and services, PayPal and other e-commerce, search engine optimization, graphics tools, photo editing, analytics, publishing, maintenance, and tutorial videos.